I’m going to review the whole thing, but with an emphasis on the second act. This does, unfortunately, mean spoilers for the first act. I’m not going to go into massive plot details or anything, but anyone who’s even remotely savvy to plot structure will probably be able to pick up on clues and work out a lot more about Act One than they should, a lot more quickly than they should. As such, if you haven’t played Act One of Broken Age, beware: there be spoilers ahead. Here is your one non-spoilery screenshot, courtesy of the game’s first act. Have they gone? Is it just you and me now? Right. I have this wonderful little talent, which I suspect I inherited – in some strange, non-biological way – from my father. In his youth he worked as a cinema projectionist, and seeing the same films over and over again led to him developing the superpower of quickly forgetting the endings to most films he sees. Not the sort of thing that’d get you into the X-Men but it sounds like a pretty good thing to have – I’d quite like to be surprised by some twist endings again. Anyway: that’s me, but with adventure games. I can pretty much do the first floor of Dungeon Master with my eyes closed, but despite having finished The Secret of Monkey Island 2 more times than I can count on my fingers, I still get stumped by a few of the puzzles in there. My mind just doesn’t retain that information for very long. Going back to Broken Age was a pleasant surprise. I went back through Act One again to refresh my memory on everything that had gone before, and was once again thoroughly charmed by Shay and Vella’s separate journeys. Mostly, though, I was impressed by the puzzles, few of which I could actually remember thanks to my aforementioned ability. Most of them are entry-level adventure game stuff, but they all work consistently with the game’s internal logic, and the dialogue and environments hint at the solutions well enough to give you the occasional nudge, but not so transparently that it feels like signposting. Act One is a really comfortable, charming, well-designed adventure. Act Two picks up where the first left off: with Shay and Vella having swapped places. Shay is now exploring Shellmound and its surrounding environs, and trying to make some sort of amends for the “help” he’s previously provided, while Vella is stuck on the spaceship and attempting to put her righteous fury to good use. While it’s still charming, Act Two is not a comfortable adventure. Broken Age‘s concluding part hasn’t so much “taken off the training wheels” as it’s ripped them off and hurled them into a volcano. And then waited for them to be belched back up in a lava flow, scooped them up, set them on fire again, and then buried them. And then danced on their grave. Unless you’re stuck on a puzzle for an hour. The first Act shouldn’t take a seasoned adventurer more than maybe three hours, tops, and that’s if they’re exhausting all the dialogue they can and examining everything in search of a joke. Act Two is significantly harder to judge, because… well, because it’s significantly harder. Not Discworld levels of insanity, but it requires a good amount of lateral thinking that asks you to ponder a couple of steps ahead. I can’t go into specifics without spoiling puzzles, and the majority of them are good enough that I really don’t want to do that, but I will say that I actually had to take notes at one point. One puzzle (revisted several times over the course of Act Two) involves rewiring devices, and which wire goes where has to be pieced together from clues lying around that… don’t actually talk about wires. On the one hand, it’s sort of annoying to have to alt-tab back and forth to another window (or make physical notes). On the other hand, it’s the sort of puzzle I love: it looks complicated and confusing at first, but once you figure out how it works, it’s beautifully elegant and entirely simple. On the plus side, even trying the wrong item tends to lead to entertaining dialogue. The most non-spoilery thing I can say about the puzzles is probably that there were a lot of stumbling block sections where I was wandering around, wondering what I’d missed. Generally speaking, the answer was “nothing”; this, thankfully, doesn’t go in for pixel-hunting. With one minor exception, pretty much everything of any use is easy to spot, and the problem is working out how best to apply it. That’s a good problem to have in this sort of game. There is also one truly superb conversational puzzle, which is something else I’m always happy to see, and you’ve usually got a few problems you can work on at any given time, so you’re rarely railroaded with just one issue. This doesn’t mean I’m not slightly pissed off at the PC version, though. There are three things I now expect of any point-and-click adventure game: the ability to skip a single line of dialogue in conversation, the ability to view all hotspots on the screen, and the ability to fast-travel by double-clicking on an exit. Unless I’ve missed something, only the latter makes an appearance here – and even that’s of limited use because most of the environments involve scrolling. I am convinced that, because of Broken Age, at least one individual is going to try this on a lonely night. The first two aren’t a big issue, but they’re a quality-of-life thing. I like voice acting (and the voice acting here is good), but I also like having control over conversations, insofar as I can skip directly to the next line of dialogue if I’ve read the subtitles. Here, I just skip the entire conversation. Likewise, viewing all hotspots isn’t exactly a life-saver in Broken Age because they’re usually pretty obvious, but the lack of this doesn’t appear to be a design choice: if you’re playing on the gamepad, you can tap the right stick to snap to the nearest hotspot in that direction, essentially giving you the ability to find them all by wiggling your right thumb. You can’t do this with a mouse, and considering that the mouse is pretty much the fundamental way of playing a point-and-click adventure, that’s a mind-boggling oversight. Wil Wheaton’s turn as a hipster lumberjack who’s now moving into metalworking is perhaps one of my favourite things about Broken Age. It’s not too hard to put up with any of this, though, because even when you’re wandering around wondering how you’re going to make use of a deflated blow-up doll and a bowl of cereal, it’s very easy to get enraptured by the gorgeous environments, the likeable characters, and the witty dialogue. 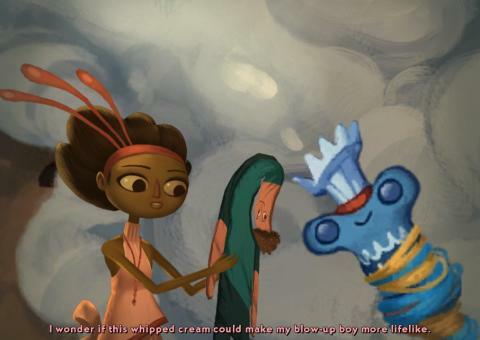 Only one moment in Broken Age Act Two actually made me laugh out loud (or, more specifically, left me giggling like an idiot for the next couple of minutes) but I spent plenty of time with a smirk on my face. Some of this is probably because Broken Age‘s second act is a bit more bittersweet about its themes of growing up, but don’t worry – I’m not going to go into detail, and Broken Age certainly isn’t heavy-handed about this. It never smacks you over the head with its themes at the expense of enjoying the adventure. But the game ends when the character arcs are complete and the immediate plot is wrapped up, not when the universe is saved from a great evil. Despite leaning in that direction a few times in the second act, you won’t find an epic tale here. That’s not something I consider a problem – the restrained, character-focused story here works incredibly well – but a few people might raise their eyebrows a little at the ending. I can’t really blame them for that, either: there are still a fair few immediate problems at the point when the game ends, and these are “resolved” in little sketches during the credits, which feels a little bit cheap. Vella’s sister is one of the others. As Psychonauts proved, Double Fine are superb at writing kids. If there’s one real disappointment, it’s that Shay and Vella never really interact during the game itself, even though their contrasting experiences and views would’ve made for some interesting (and likely touching) buddy comedy; the first act seemed to be leading up to this, and the second never really capitalises on it. This also presents a problem in gameplay terms. The pair don’t even interact in a Day of the Tentacle-esque sending-objects-to-each-other way (or, hell, even in a “having a conversation” way), but there are clues to Shay’s puzzles in Vella’s sections, and vice versa. Some of these make sense, in that it’s something the character should probably know anyway, but at least one relies entirely on the player learning something and then using it in the other area. It’s hinted a few times that Shay and Vella are instinctively linked and drawn to each other in some way, but it’s never made more explicit than that, and a few of the puzzles suffer a little because of it. I’m also sad that there aren’t that many new locations or characters. The majority of the second act has Shay wandering what was previously Vella’s area and vice versa; while things have changed, you’re not really seeing new and amazing areas, or chatting to previously unseen denizens. There’s nothing new and surprising like a city in the clouds, or a talking tree. This would probably annoy me less had I played both acts at once, rather than teasing myself with the first act a year ago, but such is the problem with this model. Broken Age is, ironically enough, not a game of two parts. It’s very much one game that works a lot better – in every respect – when it’s not split into two. The story functions better as a single arc without a break, the increase in difficulty feels a lot more natural when played as a whole, and there are a lot of hints to puzzles and plot points in Act One which only become relevant in Act Two. It’s a shame that it had to be split into two, but at least now it’s all one again. Beautiful art, excellent writing, and clever puzzles are the hallmarks of the best adventures, and they’re all present here. Broken Age doesn’t quite live up to stone-cold classics like Monkey Island or Grim Fandango, but that shouldn’t be taken as a mark against it, because all that means is that it’s not a 10/10 game. It’s maybe a little slight and it has a few minor issues in its pacing and storytelling, but it’s something any adventurer should be happy to puzzle their way through. I’m happy with what I backed, and I rather think that’s the main thing.